The Crowther Group team recently completed a new construction project in the Waterside Shopping Center in Southwest Fort Worth, TX. The design called for a showroom floor with fixtures, lighting, technology and high-end finishes, an inventory storage room, office, breakroom and lavatory. 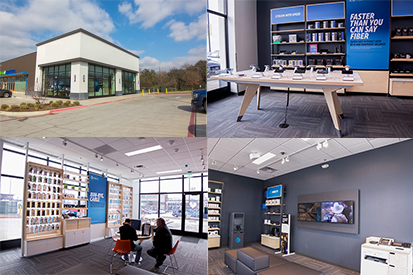 Crowther and its subcontractor partners managed the fast-track project over a 3-month period taking a core and shell storefront space and transforming it to a state-of-the-art mobility store well within budget.